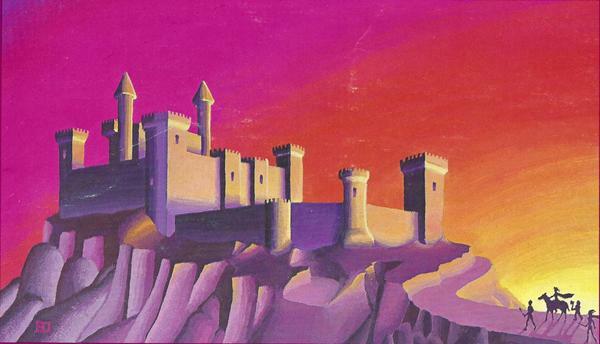 Although Erce has simmered in the visions of authors like Zelazny, Poul Anderson and Moorcock and in many ways seeks to make sense of the original Law/Chaos dichotomy of old D&D (such as presented in Keep on the Borderlands), the primary inspiration for its alignment structure (and developed well before my encounter with the OSR inspired me to take things up a notch) is Nordic mythology. A brief sketch of their worldview will go a long way towards understanding the worldview of Erce - The Aesir, the gods, were the upholders of Law, who kept humanity safe from the Chaos of the wilderness (which is full of predators, Jotun and monsters) and even built great cosmic walls to keep them at bay. 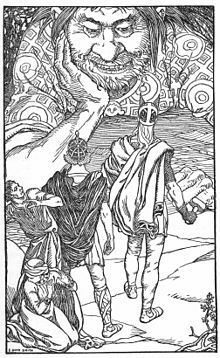 The Aesir may rule the roost before Ragnarok, but they are essentially usurpers of the cosmic order and self-aware of being so (they know Chaos will get the upper hand again at Ragnarok), having killed the first Jotun to shape the world and subjugated the rest to fit their world order. In other words, Chaos (the Jotuns) was there first and then the gods came and ordered creation. 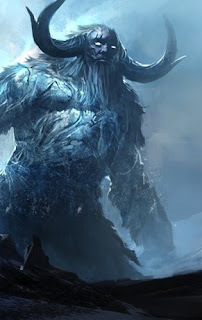 The Jotuns embody something more Natural, Primal and Chaotic, embodying the wilderness humanity struggles to thrive in. They aren't evil anymore than the passionate and often selfish and inconsistent, but civilised, Aesir are 'good' – The Aesir just happen to represent a cosmic order friendly to humanity. Rather than an ethical allegiance, humanity's bond with the gods over the Jotuns is pragmatic – they can survive much better in the world the Aesir built. Of course, it wasn't as cut and dried as that – The Nordics knew when to pay respects to natural forces rather than just beat it down (just as the Aesir would do every now and then, even marrying Jotuns at times!) 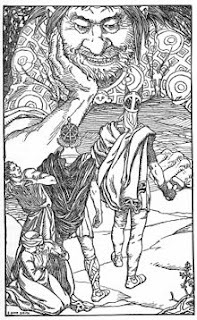 and those who would practise Seidr (magic), whether they were within the Law or Outlaws (ie without tribe or home and so not protected by any laws or customs anymore), must become intimate with Chaos in ways that were innately unsettling to people of Lawful and godly outlook (just as Odin's Seidr, though valued, was unsettling to the other Aesir). Walls held both practical and metaphysical value – they kept human enemies out – but they also served as a barrier between the ordered community, where the gods could watch over them and the chaotic realms outside humanity's reach. Jotunheim was also known as Utgard ('outside the fence'). Asgard and Midgard then were Ingard, inside the fence. Literally. There are myths about how the Aesir built a wall around Asgard to keep Chaos out and for that matter Jotunheim to keep Chaos in. Erce is like this in many ways. Except, instead of Jotuns there are Faerie (though these Faerie are more of a cross between the savage Jotuns and magical Faerie), and besides these, demons, dragons, elves, Slumbering Things Beyond the Stars, etc are all creatures of Chaos only too happy to tear down the constraints of Law. On the side of Law- Gods, angels humans, Dwarves and halflings bring some order to the cosmos and the Middle World - or at least the parts of it humanity lives in. Stray far enough from the human demesnes, the Dominions of Law, cross the borderlands and into the Mythlands and the world begins to follow different natural laws, more narrativist than physical, as Chaos reigns. I'd like to think the Mythlands of Erce is not only a good fit for this vision, but takes this vision and runs away with it until it takes on a life of its own. Probably in ways Gygax and friends didn't really intend to go, but which their adventures would naturally come alive in.